This chapter describes PhAB's environment in more detail, and how you can customize it. Standalone PhAB only*. Create a new application; see “Creating an application” in the Working with Applications chapter. Standalone PhAB only*. Open an existing application; see “Opening an application” in the Working with Applications chapter. This command is also available through PhAB's toolbars. Standalone PhAB only*. Close the current application; see “Closing an application” in the Working with Applications chapter. Discard any changes and re-load the project from the last saved version. Save the current application, under the same or a different name; see “Saving an application” in the Working with Applications chapter. The Save command is also available through PhAB's toolbars. Save As is available in Standalone PhAB only*. Import files created by other applications; see “Importing PhAB modules from other applications” in the Working with Applications chapter. Export the code used to create a module in a file called module.code; see “Export files” in the Working with Applications chapter. End your current PhAB session. PhAB prompts you if there are any changes that you haven't yet saved. This menu also lists the last few applications that you edited. 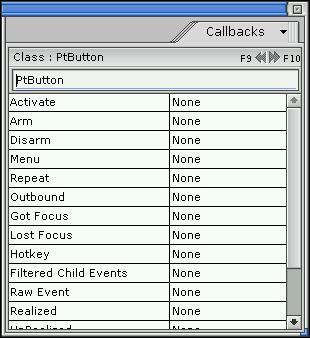 *When using PhAB in the IDE, projects are managed from the IDE, so these menu items are disabled. For more information see “Creating a QNX Photon Appbuilder Project”, in the Developing Photon Applications chapter of the IDE User's Guide . importing images, XBMs, and modules. The text Undo and Redo menu items changes depending on the current operation. Cut and copy widgets to the clipboard, and paste them from it; see “Clipboard” in the Creating Widgets in PhAB chapter. These operations also apply to module links. Move a widget from one container to another; see “Transferring widgets between containers” in the Creating Widgets in PhAB chapter. Delete a widget without saving it on the clipboard; see “Deleting widgets” in the Creating Widgets in PhAB chapter. Select all the children widgets in the current selected widget or module. Deselect the current widget or widgets. This option also selects the current module. Display the Find dialog, which allows you to do find widgets in the current application by name, type, contained text, called function, or link. Customize PhAB's widget palettes. You can create new palette folders, add widgets to a folder, delete widgets, and change icons, colors and other properties. 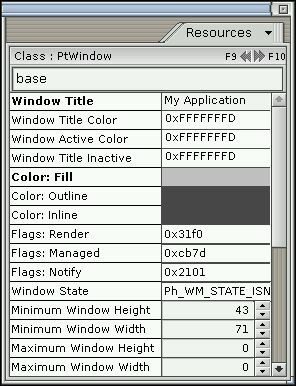 PhAB preferences, such as colors, editing commands, and styles of resource names. Many of these commands also appear in PhAB's toolbars. Open the New Window Style dialog to add a new window to your project. Open the New Dialog Style dialog to add a new dialog to your project. Add a new menu module to your project. Add a new picture module to your project. Switch to edit mode, which means you can add widgets and modules to your projects, add callbacks, and so on. When PhAB is launched, it starts in this mode. Switch to test mode, which means you can test the appearance of your GUI. Allows you to zoom in, zoom out or move around, by using the mouse and keyboard. After zooming in or out on the desired area, you must return to Edit Mode or Test Mode to continue editing or testing. 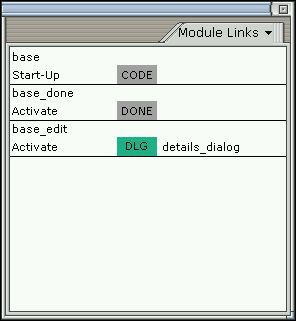 An internal link is a PhAB mechanism that lets you access a PhAB module directly from your application's code; see the Accessing PhAB Modules from Code chapter. Generate a report on the application's widgets and modules. A menu of commands used to create multilingual versions of your application; see the International Language Support chapter. Information used for the application as a whole, including global headers, initialization function, and which modules to display at startup. For more information, see “Specifying your project properties” in the Working with Applications chapter. Standalone PhAB only. Explicitly converts your project to the Eclipse PhAB Project format, if it hasn't already been converted. A project must be in this format to be opened by PhAB from the IDE. New projects are created in Eclipse PhAB project format by default, but you must explicitly convert multiplatform projects created in a previous version of PhAB. Standalone PhAB only*. Builds the current project, and then runs it. If required, this command will save open files, generate support files, compile, and link the application. See the Generating, Compiling, and Running Code chapter. Standalone PhAB only*. Builds the current project, then launches it inside the preferred debugger. You can set breakpoints, step instruction by instruction, etc. See the Generating, Compiling, and Running Code chapter. Standalone PhAB only*. Rebuilds the current application by compiling all the files (equivalent to a “Make Clean” and then a “Build”). See the Generating, Compiling, and Running Code chapter. Standalone PhAB only*. Builds the current application. If required, this command will save open files, generate support files, compile, and link the application. See the Generating, Compiling, and Running Code chapter. Standalone PhAB only*. Runs a “make clean” for all the current target platforms. Generates just the supporting files for the current application. See the Generating, Compiling, and Running Code chapter. Standalone PhAB only*. Runs the last compiled version of the current application. See the Generating, Compiling, and Running Code chapter. Standalone PhAB only*. Opens the Manage Targets dialog, which allows you to add and delete target platforms for the current application. See the Generating, Compiling, and Running Code chapter. *When using PhAB in the IDE, projects are built and run from the IDE, so these menu items are disabled. For more information see “Building a QNX Photon Appbuilder Project”, in the Developing Photon Applications chapter of the IDE User's Guide . Contains commands that let you change the order of selected widgets relative to one another. You can Raise, Lower, Move To Front, Move To Back. Contains commands for aligning the selected widgets; see “Aligning widgets” in the Creating Widgets in PhAB chapter. Contains commands to evenly distribute selected widgets horizontally or vertically, taking into account the size of each widget. These commands match the respective resources or callbacks of the selected widgets. The widget selected first is used as the source and subsequently selected widgets are modified. The source and destination widgets are highlighted with different colors (provided you have Show Selection set in the View menu). Opens the Match resources and callbacks dialog, which lets you match multiple resources and callbacks. The widget selected first is used as the source and subsequently selected widgets are modified. If the destination widget has the selected resource, then its value is set to the same value as the source widget's corresponding resource. Combine selected widgets into a group, or split up a selected group; see “Aligning widgets using groups” in the Geometry Management chapter. Contains commands to lock the position or size of the selected widget. Change the class of the selected widgets; see “Changing a widget's class” in the Creating Widgets in PhAB chapter. A template is a customized widget that you want to use as the basis for other widgets. This command opens the Define template dialog, which lets you create or edit a template; see “Templates” in the Creating Widgets in PhAB chapter. Zoom the display in or out. Use these commands for doing precise alignments of your widgets. For example, if you zoom out so that the zoom factor is less than 100%, your workspace is larger, helping you work on a 1280x1024 application even if your display is set to 800x600. Fits the current selection to the window by adjusting the zoom factor. Returns to 100% zoom, the default screen size. Toggles the grid display. 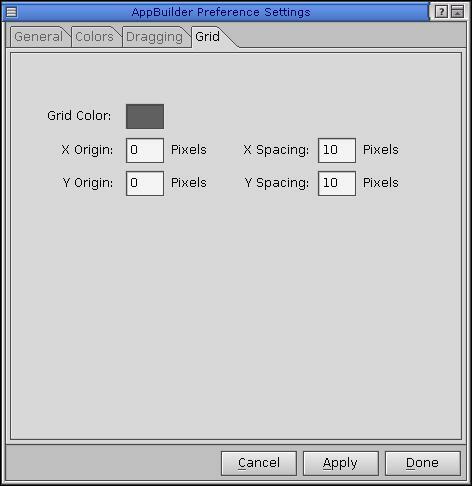 The settings for the grid can be adjusted on the Grid tab of the AppBuilder Preference Settings dialog. See the Preferences option of the Edit menu. Toggles the snap to grid option. When this option is on, new or moved widgets are “snapped” to the grid—that is, they are aligned with the closest vertical and horizontal grid lines. The grid does not have to be visible for this option to work. Toggles the widget selection option. When this option is on, selected widgets are highlighted with colored rectangles. When multiple widgets are selected, the first widget has a different selection color than subsequently selected widgets. This makes it easier to align or match widgets, where the first selected widget is the source. It also makes it easier to see what's exactly selected when widgets overlap. Arranges the currently open modules so that they're stacked from the upper left to lower right in PhAB's workspace. Arranges iconified modules in PhAB's workspace in a grid along the bottom of the workspace. Sends the currently selected module to the back of the workspace. Note that a module will always appear in front of the iconified modules. Iconifies the currently selected module. A closed module appears as an icon at the bottom of the workspace. Iconifies all the application's modules. These commands show or hide control panels for defined templates, resources, callbacks, module links, module trees, and project files. If a control panel is shown, the corresponding menu command changes to Hide. Links to the appropriate section of this programmer's guide. A link to the Photon Library Reference . The version number and copyright information for PhAB. Context-sensitive help — To get help on a part of PhAB's user interface, click on the question mark button, then click on the item in question. The Helpviewer displays the information on the selected item. Balloon help — To find out what a button in the widget palette or toolbars is for, pause the pointer over it. A descriptive balloon appears. Standalone PhAB only*. Open an existing application; see “Opening an application” in the Working with Applications chapter. This command is also available through the File menu. Save the current application; see “Saving an application” in the Working with Applications chapter. 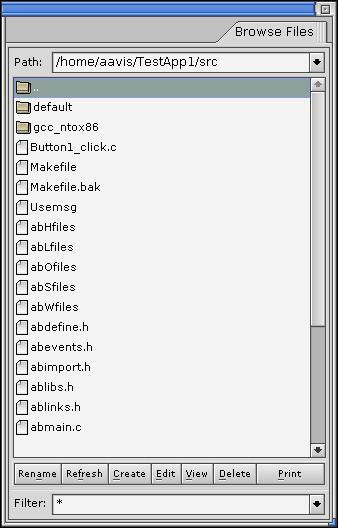 The Save command is also available through the File menu. Delete and copy widgets to the clipboard, and paste them from it; see “Clipboard” in the Creating Widgets in PhAB chapter. These commands are also available through the Edit menu. Move a widget from one container to another; see “Transferring widgets between containers” in the Creating Widgets in PhAB chapter. This command corresponds to the Move Into command in the Edit menu. Turn the anchor flags for widgets on or off in the design workspace. This setting does not affect run-time anchoring in your application. For more information on anchoring widgets, see “Constraint management using anchors” in the Geometry Management chapter. Switch to edit mode, where you can add widgets and modules to your project, add callbacks, and so on. This is the default mode when PhAB is launched. 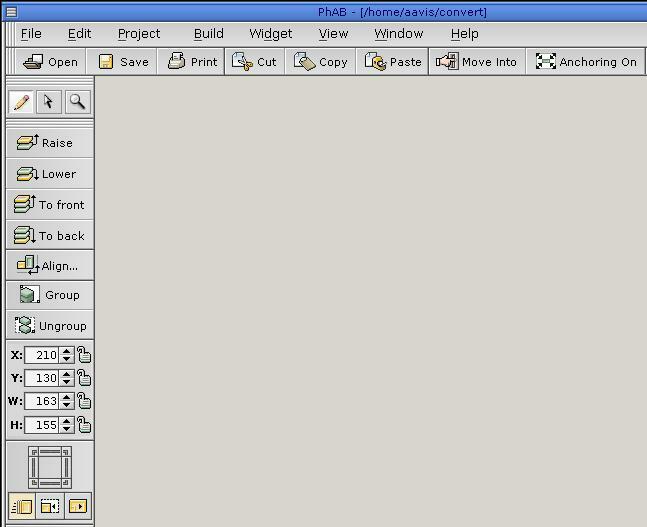 This command corresponds to the Edit Mode command in the Project menu. Switch to test mode, where you can test the appearance of your GUI. This command corresponds to the Test Mode command in the Project menu. Switch to zoom mode, where you can increase or decrease the zoom by using the mouse and keyboard. After changing the zoom, you must return to edit or test mode to continue editing or testing. This command corresponds to the Zoom Mode command in the Project menu. Move the selected widgets forward or backward in, or to the front or back of the widgets in the container; see “Ordering widgets” in the Creating Widgets in PhAB chapter. The To Front and To Back commands are also available through the Arrange submenu of the Widget menu. The most frequently used commands for aligning the selected widgets; see “Aligning widgets” in the Creating Widgets in PhAB chapter. For more choices of alignment, see the Alignment item in the Widget menu. Combine selected widgets into a group, or break up a selected group; see “Aligning widgets using groups” in the Geometry Management chapter. These commands are also available through the Widget menu. The coordinates and size of the currently selected widget. To change them, type the new values and press Enter. To avoid changing a coordinate or dimension for the current widget, lock it by clicking on the padlock so that it closes. You can't change the field (either by typing or dragging) until you unlock it, although you can change its position using the nudge tool. The locks are saved with your application. Every click on the frame buttons nudges, stretches, or shrinks the selected widget by one pixel. To nudge by multiple pixels, hold down the mouse button. You can also use the Ctrl key and the numeric keypad to nudge, stretch, or shrink a widget. Each key corresponds to one of the nudge buttons. Pressing Ctrl-5 switches between modes, and Ctrl-↑ works like the tool's top frame button. PhAB includes a set of control panels (also referred to as “palette windows”) that display information about the currently selected widget or widgets. They're displayed by default in PhAB, and you can move them anywhere you like. If you close a control panel, you can reopen it by choosing the appropriate item from the View menu. They're described in the sections that follow. The control panels are originally displayed as a stack in a PtPanelGroup widget. If you click on the panel tab, a menu of the panels appears. If you expand the window enough, all the tabs are displayed in a line. You can drag panels away from this group to customize the display. If you drop it on the background of PhAB's work area, it becomes a new panel group. If you drop it on another panel group, the panel joins that group. You're then free to resize the panel groups are you see fit. 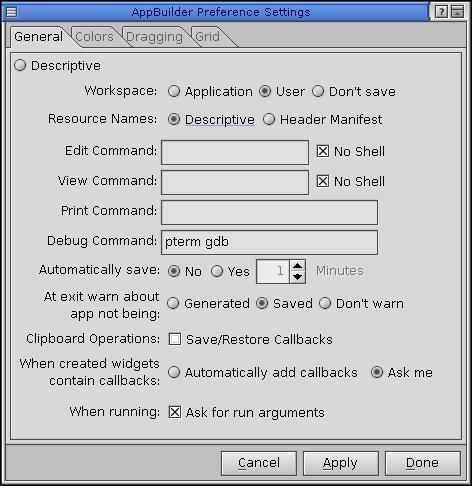 Depending on your choices in the AppBuilder Preferences Settings dialog, the arrangement of panels is saved with your application or for all your PhAB sessions. The widget palette lets you add widgets to your application. If you close this panel, you can reopen it by choosing Show Templates from the Window menu, then selecting a pallet. The predefined Widget palette is a collection of templates grouped into a folder called “Widgets”. You can create your own templates by selecting Widget-->Define Template. You can also customize the templates in the Widget palette by choosing Templates from the Edit menu. If a template is permanently removed from the Widget palette, you can always add it back by selecting Add Widget Class from the Edit menu. For more information on templates, see Adding a widget class in the Creating Widgets in PhAB chapter.. The widgets are arranged and color-coded by type. The names are optional; to hide or display them, right-click on the palette and choose the appropriate item from the pop-up menu. Pause the pointer over it until a help balloon pops up. See the Widgets at a Glance appendix. For information on using specific widget classes, see the Photon Widget Reference . Lets you select existing widgets and modules in the work area. Lets you create new widgets. Look at the widget palette—If an icon button is pushed in, you're in create mode. Look at the pointer—If the pointer is a single-headed arrow when you move it into the work area, you're in select mode. If the pointer is anything else, you're in create mode. To switch to create mode, click on any widget icon in the widget palette. You can now create one or more instances of that widget. For more information, see “Creating a widget” in the Creating Widgets in PhAB chapter. Click the right mouse button in a module or on the background of the PhAB work area. Click on the background of the PhAB work area. Note that this might not work if the selected template in the Widget palette creates a module. In this case, even if you click on the background of PhAB, the module specified by the template is created at the pointer position. Click on the selected widget in the widget palette. For most widgets, PhAB returns to select mode as soon as you've created a widget, but you can stay in create mode by pressing the Ctrl. This allows you to create multiple instances of the widget, one after another. Note that PhAB stays in create mode when you create some widgets (such as PtLine, PtPolygon, and PtPixel). If you close this panel, you can reopen it by choosing Show Resources from the Window menu. The class of the selected widget. Let you navigate sequentially through widgets in the current module. These buttons also let you select multiple widgets or select widgets within a group. For more info, see the “Selecting widgets” section in the Creating Widgets in PhAB chapter. Lets you enter a unique instance name for the widget. For more information, see “Instance names” in the Creating Widgets in PhAB chapter. You can change the value of a resource right in the control panel, or you can use the full-featured editor by clicking on the resource name. For more information, see the Editing Resources and Callbacks in PhAB chapter. By default, the Resources and Callbacks control panels display resource labels descriptively. If you pause the pointer over a resource, the header manifest is displayed in a popup balloon. To have the labels displayed as the actual header manifests (convenient when writing code), open the Preferences dialog and change the setting in the Resource Names field. To open this dialog, choose Preferences from the Edit menu. Now if you pause the pointer over a resource, the popup balloon displays the descriptive label. You can also copy a resource manifest or value by right clicking on the left column of the resources or callback panel. Select Copy resource manifest to ph clipboard to copy the resource manifest (for example, Pt_ARG_WINDOW_RENDER_FLAGS). Select Copy resource value to ph clipboard to copy the actual resource value. The control panel doesn't display all the resources for a widget. PhAB sets Pt_ARG_AREA, Pt_ARG_DIM, Pt_ARG_EXTENT, and Pt_ARG_POS automatically when you move or resize a widget. Some other resources are too complex to edit in PhAB. If you close this panel, you can reopen it by choosing Show Callbacks from the Window menu. 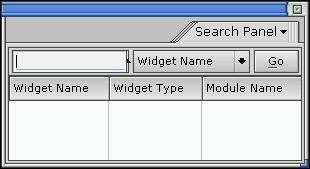 This panel, like the Resources panel, displays the widget class and instance names, and the next and previous buttons. the number of callbacks if there's more than one. You can right-click a callback name to copy its manifest or value. Pause the mouse over a callback name to view its manifest and a short description in a pop-up balloon. To create a callback or to edit an existing one, click on the appropriate resource (for example, Pt_CB_ACTIVATE). 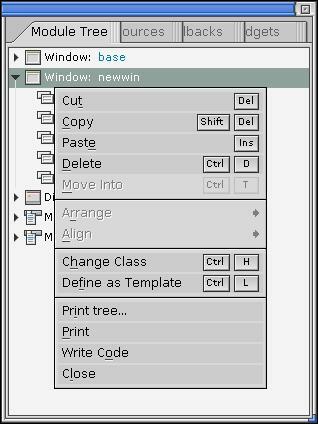 If you close this panel, you can reopen it by choosing Show Module Tree from the Window menu. See the parent/child relationships of the module's widgets. Select a widget inside a group. Find a widget by name. Select a widget hidden underneath another widget. To select a widget from the tree, click on the widget's name. 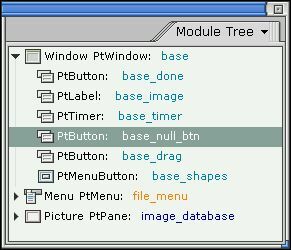 The menu for the Module Tree panel. If you close this panel, you can reopen it by choosing Module Links from the View menu. The Browse Files panel is a file browser that you can use to view, edit, delete, print, create, and rename the files related to your application. Use the Filter to select or enter a regular expression to filter the list of files. For example, *.c displays only files with a .c extension. The Search dialog lets you search your application for widgets of a specified type, name, text resource, and so on. Open this dialog by choosing Find from the Edit menu. In the text field, type the exact name of the widget or a regular expression. For example, a value of my_button* matches all the widgets whose names begin with my_button. Type a class name or a regular expression (e.g. PtScroll*), or use the combobox to select a widget class. Type specific text or a regular expression to look for in the widgets' text resources. Search for the widgets that have attached a callback of the type (Code, Done, and so on) selected from the pattern combo box. Type a function name or a regular expression. Type a module name or a regular expression. All the widgets that have a callback pointing to a module whose name matches the pattern are selected. Next, press the Go button. The matching widgets are displayed in a list. Select entries from the list to select the actual widgets; the PhAB modules they're in are opened or made visible. Click on the tab for the group of settings you wish to change: General, Colors, Dragging, or Grid. Lets you decide whether to save your preferences on a per-application or per-user basis, or not at all. By default, the Resources and Callbacks panels display resource labels descriptively. This field lets you display the labels as the actual header manifests, which you may find helpful when writing code. Note, however, that manifests are long and take up more screen space. If you pause the pointer over a resource, the label not displayed in the control panel is displayed in a popup balloon. Lets you specify an external editor to edit source files. Lets you specify the file viewer to use to view source files. Lets you specify the print command used to print a selected file (in the Project tab, for example). Lets you specify the command used to debug your application. Whether or not to save the application automatically, and how often. Whether or not to warn you when you exit PhAB without generating or saving your application. Lets you specify if callbacks should be saved along with widgets when copying from or cutting to the clipboard. Lets you specify whether you're prompted to add callbacks when newly created widgets contain callbacks. Lets you specify whether PhAB prompts you to enter runtime arguments when you run an application from the Build menu. The color for the first widget selected. Turn this feature on by selecting View-->Show Selection. The color for widgets selected after the first widget. Turn this feature on by selecting View-->Show Selection. Drag widgets and modules as outlines rather than as full objects. The amount you must drag a widget or module before it moves. This factor helps avoid the annoyance of moving a widget when you really mean to select it. You can use a grid to position and size widgets. Choose the color of the grid. Specify the origin and spacing of the grid.